Riot police form a barricade to prevent protesters from blocking the removal of tyre barricades. PRACHUAP KHIRI KHAN ― Clashes broke out between riot police and rubber farmers who tried to block Petchkasem Road in Ban Sang district Thursday evening, leaving many injured from acid and ping-pong bomb attacks, including the chief of the provincial police. About 10 people including the commander of Prachuap Khiri Khan police were injured in the confrontations in Bang Saphan district. The first clash, which lasted about 40 minutes, began at 6pm when 1,000 angry protesters tried to close both inbound and outbound lanes of Petchkasem Road, the only major highway to the South, at the 412–413 kilometre markers with 50 tractor and car tyres. Police appealed to the demonstrators not to block the traffic, telling them it was illegal. 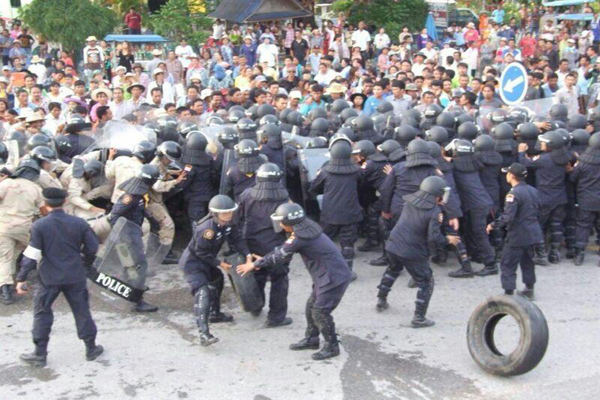 The farmers ignored the appeal, and riot police moved to disperse them. The clash, which involved pushing and jostling, lasted about 40 minutes before the farmers retreated to a side of the road. Famers threw acid used in rubber production at the police, injuring many, including Pol Maj Gen Thanet Sunthorasuk, chief of Prachuap Khiri Khan, who sustained abdominal injuries. This entry was posted in ΝΕΑ ΑΠΟ ΤΟ ΜΕΤΩΠΟ and tagged ΤΑΡΑΧΕΣ, ΤΑΫΛΑΝΔΗ, ΤΟΠΙΚΟΣ ΑΓΩΝΑΣ on September 5, 2013 by simeioseis. This entry was posted in ΝΕΑ ΑΠΟ ΤΟ ΜΕΤΩΠΟ and tagged ΑΠΕΡΓΙΑ, Ν. ΑΦΡΙΚΗ on September 5, 2013 by simeioseis.